Chet Atkins is remembered for the smoother country music style known as the Nashville sound with his Gretsch Country Gentleman, model G6122. Here is a link to a youtube video of him talking about Gretsch guitars. He later fell out with Gretsch and Gibson made a few different models for him. Duane Eddy is noted for his characteristically “twangy” sound using the Gretsch “Chet Atkins 6120” model. In 1997, Gretsch Guitars started production of the Duane Eddy Signature Model, the Gretsch 6120-DE. In 2004, The Gibson Custom Art and Historic Division introduced the new Duane Eddy Signature Gibson guitar. A new Gretsch G6120DE Duane Eddy Signature model was released in Spring 2011. More on that here. 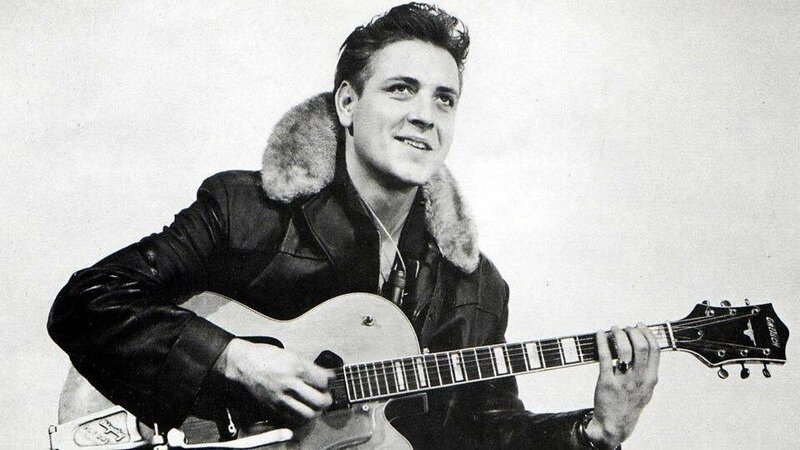 Eddie Cochran played a Gibson L-4C archtop but later moved to a 1955 Gretsch 6120 Chet Atkins G-brand Western model, which Eddie had modified. He replaced the neck position De Armond Dynasonic pickup with a black covered Gibson P-90 pickup as shown below. He also used Martin acoustic guitars.